The Central Zoo Authority in India has confirmed to the BBC that zoos and circuses in the country will no longer be allowed to keep elephants. A spokesman for the authority said a binding directive had been issued by the authority for the animals to be sent to national parks and sanctuaries. It is estimated that there are about 140 elephants in zoos and circuses. 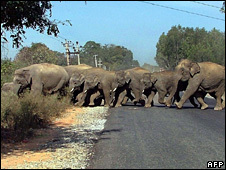 Among the most regularly visited by tourists are three elephants in Delhi zoo, which are to be moved imminently. The directive sent by by the Central Zoo Authority (CZA) says zoos and circuses are "not the best places for the large animals" which "require a large area to move about freely". The CZA says circus and zoo elephants can play an important eco-tourism role in national parks and animal sanctuaries, where they can be properly supervised by mahauts - or elephant handlers. The body has ordered the transfer to take place "as soon as possible". It says that the animals have "great use" in eco-tourism and patrolling national parks and tiger reserves. Correspondents say the CZA's move does not affect hundreds of elephants that are kept in temples across the length and breadth of India - neither does it affect those used for working purposes. African elephants - held in Delhi and Mysore zoos - will be transferred to national parks as well as the native Indian elephants, officials say.